In the summer of 2011, we joined ‘Share Love with Friends (SLWF)’, which is an organization working with the disabled, alongside the Welfare Department at the Nongprue Municipality. Since then, our participation has been to purchase and distribute rice to impoverished families with disabled children, and to be there each month to oversee the operation, help hand out the sacks of rice and, if families cannot travel with their children on that day, we home deliver. This direct involvement has been a boon for us in terms of getting to know the families, the children and their names. This relationship has also allowed us to assess other needs they might have, such as walking aids and wheelchairs, which we gladly provide. Suratthikarn with the previous undesired feeding system through her nose. Whenever we can, we also help the families with their mode of transport, which is typically an old motorbike with a side car often seen plying the roads here. Up to now, we have supplied second hand bikes donated by friends and/or modified side cars to help them make a living selling food, collecting recyclables or for just getting around with the family. After all, many of these children are house-bound, and it’s good to get them out in the sunshine for a period. Special cases also arise, when children have health issues and need assistance or certain equipment. 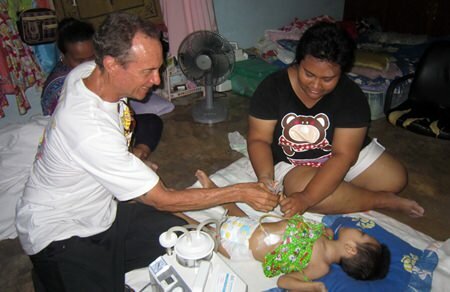 For example, recently one such girl, Suratthikarn, 4 years and seven months, was born severely handicapped and needed to go to Chonburi Hospital for surgery. Since birth she was unable to swallow properly and had to be fed through her nose via a rubber feeding tube. But this system continuously interfered with her breathing, which was and made more difficult given the mucus she was producing. As a result, without adequate nutrition, she became frail and weak. The doctors decided she needed a gastrostomy feeding tube, which involves making a surgical cut on the left side of the stomach wall where one end of the tube is inserted. On the other end of the tube is where soft and liquid food is introduced by syringe, which then goes straight into the stomach. Suratthikarn also needed a phlegm suction machine to be used at home after she left the hospital. We called Sam, who heads SLWF, and told him the good news. He said the timing was perfect as the girl had just come home from the hospital. So we went there to hand over the goods and check on the girl. We were happy to see that she was in good spirits, which was confirmed by her mother, who said that she was definitely more comfortable now. Sure enough she allayed any hesitations we might have had when she showed us her smile. Though we are content with the consequence, we also know that the job is not done. Follow-up visits for cases like this are very important, especially when there is an unhealed wound requiring strict hygiene to stave off infection. A special thanks to Graham, Jay and Big Jim. If you would like to learn children like Suratthikarn, please go to www.care4kids .info, www.facebook.com/jesterscare.kids and/or https: //twitter.com/JestersCare4Kid. (L to R) The phlegm suction machine donated by the Graham and Jay, the gastrostomy wound site on the girl, and Woody handing the cash from Jim to the mother. Please remember our events are coming up fast: Children’s Fair, Sunday, September 7th, at Regent’s International School Pattaya and Gala Party Night, Saturday, September 20th at Amari Ocean Pattaya.